D Craig Schira (Regina, Vancouver, 2003-09) has signed a two-year contract with Rögle Ängelholm (Sweden, SHL). This season, with Luleå (Sweden, SHL), he had six goals and nine assists in 42 games. . . .
F Antonín Honejsek (Moose Jaw, 2009-11) has signed a one-year contract with Zlín (Czech Republic, Extraliga). This season, with Brno (Czech Republic, Extraliga), he was pointless in seven games. On loan to Hradec Králové (Czech Republic, Extraliga), he had seven goals and 12 assists in 34 games. . . .
F Lukáš Vantuch (Calgary, Lethbridge, 2005-07) has signed a one-year extension with Liberec (Czech Republic, Extraliga). This season, in 47 games, he had four goals and six assists. Foote with a headshot on McKenzie yesterday gets suspended today, but then the league suspends Overhardt and Weinger too. For what exactly? The WHL suspended three players on Wednesday, all of whom sat out Game 4 between the Kelowna Rockets and host Portland Winterhawks last night. . . . Unfortunately, the WHL’s aversion to transparency has reared its ugly head again, so fans are left with nothing in the way of explanations from the league and that really is a shame. . . . What we do know is that six players who took part in Game 3 were missing from Game 4. . . . According to the WHL website, two Winterhawks — F Alex Overhardt and F Evan Weinger — and Kelowna D Cal Foote all drew TBD suspensions “under supplemental discipline.” . . . We can assume that Foote was suspended after his late-game elbow to the head took out Portland F Skylar McKenzie, who was scratched last night and is believed to have a concussion. . . . D Braydyn Chizen of the Rockets didn’t finish Game 3, so perhaps he was injured on a play involving Overhardt or Weinger. The Rockets also scratched F Erik Gardiner last night, so perhaps he was injured on a suspendible play on which there wasn’t a penalty called. . . . After searching for info, I think Overhardt was suspended for a slash to one of Chizen’s knees, while Weinger hit Gardiner from behind. Weinger was given a cross-checking penalty. . . . Of course, all of that is pure speculation because the WHL, unlike many other leagues, including the NHL and the OHL, doesn’t offer its followers anything in the way of explanations for these decisions, not through video or even a news release. Drew Wilson, the radio voice of the Prince Albert Raiders, is moving on, all the way to Saskatoon. Wilson has been the Raiders’ play-by-play man on CKBI since October 2004. He also worked as the sprots director for Rawlco Radio in Prince Albert. Now he is joining the sports department of the Saskatoon Media Group, which is headed up by Les Lazaruk, the long-time radio voice of the Saskatoon Blades. . . . In Saskatoon, Wilson will handle morning sportscasts, and also will be involved in coverage of the Saskatchewan Roughriders, Saskatoon Hilltops, the various U of Saskatchewan teams and other sporting goings-on in the city. Mark Recchi, one of five owners of the Kamloops Blazers, was among the class of 2017 that was inducted into the B.C. Sports Hall of Fame in Vancouver on Wednesday. Recchi played 22 seasons in the NHL, totalled 1,533 points, including 577 goals, and won three Stanley Cups. . . . Recchi played three seasons in the WHL, one (1985-86) with the New Westminster and the next two with the Blazers. . . . Tom Gaglardi, who owns the NHL’s Dallas Stars, is the Blazers’ majority owner, with Recchi, Jarome Iginla, Darryl Sydor and Shane Doan splitting the rest. The 2018 World Junior Championship is scheduled to be decided in Buffalo and a schedule has been released. Included in the release, which is right here, are the prices for tournament ticket packages. Keep in mind that Canada won’t play on New Year’s Eve in this tournament. Instead, it and Team USA will meet outdoors on Dec. 29. It is the only game listed on the schedule that doesn’t yet have a starting time. In its final round-robin game, Canada will play Denmark on Dec. 30. Brent Gunning, a Toronto sportscaster, checked Stub Hub and found the cheapest ticket in each of the buildings where an NHL game was played last night: Ottawa, $34; Minneapolis, $88; Pittsburgh, $88; Montreal, $89; and Edmonton, $220. You’re right. The recliner suddenly feels a lot more comfortable. At the same time, the Oakland A’s are in the process of removing the tarps from the third deck of Oakland Coliseum and they will sell tickets for the uncovered seats for $15 each. MORE ON THE MOVE: D Sam Ruopp, who played out his junior eligibility with the Prince George Cougars this season, has joined the Cleveland Monsters, the AHL affiliate of the NHL’s Columbus Blue Jackets. This season, he had four goals and 20 assists in 55 games. He was a fifth-round pick by the Blue Jackets in the NHL’s 2015 draft. Ruopp is the seventh player off the Cougars’ roster to have moved on to the AHL since their season ended. The Marquette, Mich., Mining Journal reported Wednesday that “charges of residential mortgage fraud and forgery of a document affecting real property against former Northern Michigan University hockey coach Walt Kyle have been dropped. Marquette County Prosecuting Attorney Matt Wiese announced his decision to dismiss the charges (Wednesday), stating that additional evidence has been presented after the charges were authorized last month.” . . . Kelsie Thompson’s complete story is right here. . . . Kyle spent two seasons (1992-94) as the head coach of the WHL’s Seattle Thunderbirds. . . . He had been NMU’s head coach for 15 seasons when the school announced in March that he wouldn’t be returning. Portland tin hat conspiracy brigade out in full force tonight. Best night for them since the day the sanctions were doled out. opportunity to wrap it up on Friday in Kelowna. . . . Last night, the Rockets took control with five second-period goals. . . . F Carsen Twarynski (3) gave the visitors a 1-0 lead at 1:48 of the first period. . . . Gardiner opened the second-period with two PP goals, at 2:07 and 5:49. . . . F Cody Glass gave the Winterhawks a glimmer of hope with his fourth goal, on a PP, at 9:41. . . . Kelowna F Nick Merkley upped the lead to 4-1 when he scored on a penalty shot at 14:09. . . . F Calvin Thurkauf followed with a pair of goals, at 14:37 and 17:55. . . . D Caleb Jones (2) added a third-period PP goal for Portland, with F Rodney Southam (1) scoring shorthanded for the Rockets. . . . Gardiner now has eight goals and eight assists in 10 playoff games. 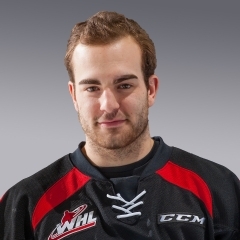 He joined the Rockets after the trade deadline, and put up 37 points, including 18 goals, in 28 games. . . . Merkley picked up two assists, while Thurkauf earned one. . . . F Colton Veloso had two assists for Portland, with Jones getting one. . . . Kelowna got 35 saves from G Michael Herringer. . . . Portland starter Cole Kehler was beaten six times on 32 shots. Shane Farkas came on to play the third period, stopping seven of eight shots. . . . Kelowna was 2-2 on the PP; Portland was 2-5. . . . With D Cal Foote (suspended) and F Erik Gardiner and D Braydyn Chizen (both undisclosed injuries) scratched, the Rockets added F Conner Bruggen-Cate, D Kaeden Korczak, 15, and D Konrad Belcourt, 16, to their lineup. . . . The Winterhawks added D Matthew Quigley, F Jake Gricius and F Bronson Sharp to replace F Skyler McKenzie (concussion) and suspended forwards Evan Weinger and Alex Overhardt. . . . Twarynski took a boarding major and game misconduct at 16:12 of the third period, so there may be a suspension in his future. . . . Announced attendance: 4,469. . . . Portland freelancer Scott Sepich covered the game for The Oregonian and his story is right here. the Hurricanes. . . . The series is tied 2-2, with Game 5 in Medicine Hat on Friday night. . . . They’ll be back in Lethbridge for Game 6 on Sunday. . . . Last night, the Tigers had to erase a 2-0 first-period deficit. . . . F Giorgio Estephan’s eight goal, and sixth in his last three games, gave Lethbridge a 1-0 lead at 10:25. . . . That was the first time in seven games in these playoffs that the Tigers had allowed the opening goal. . . . F Egor Babenko (4) made it 2-0 at 17:22. . . . The Tigers got to within a goal when F Chad Butcher (3) scored at 18:06 of the second period. . . . F Max Gerlach (2) forged a 2-2 tie, on a PP, at 13:28 of the third period. . . . Dahlstrom won it with his fifth goal of these playoffs. . . . The Tigers got two assists from F Mason Shaw, with Gerlach and Dahlstrom each getting one. . . . G Michael Bullion earned the victory with 28 saves. . . . Lethbridge G Stuart Skinner turned aside 56 shots. . . . Medicine Hat was 1-4 on the PP; Lethbridge was 0-3. . . . The Hurricanes had D Calen Addison and F Zak Zborosky back in the lineup, but F Matt Alfaro was scratched again. . . . Lethbridge also scratched F Zane Franklin. 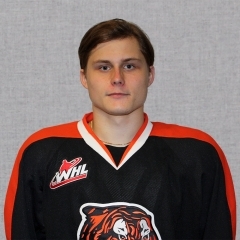 Ryan McCracken of the Medicine Hat Tigers tweeted: “Hearing Franklin broke his hand, likely in the Game 2 fight with (Tigers F) Zach Fischer.” . . . D Brad Forrest played for the Tigers for the first time since the first game of the playoffs. With Forrest in, F Ryan Chyzowski was scratched. . . . Announced attendance: 4,920.